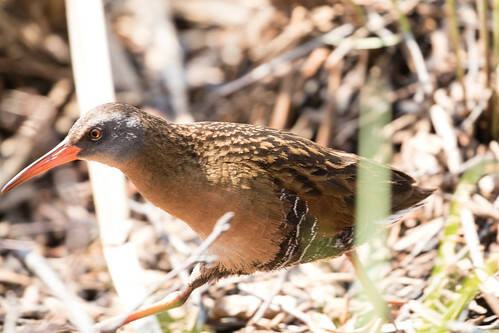 Laura's Birding Blog: Virginia Rails! I consider myself a bird watcher, but even with some high-frequency hearing loss, many more of the birds I count in a given day are heard rather than seen. I get a lot of pleasure and joy when I get a good look and hear some songs or calls, but for the most part, just hearing birds is as wonderful for me as just seeing them. There are quite a few birds that if I had to choose, I’d rather hear than see. 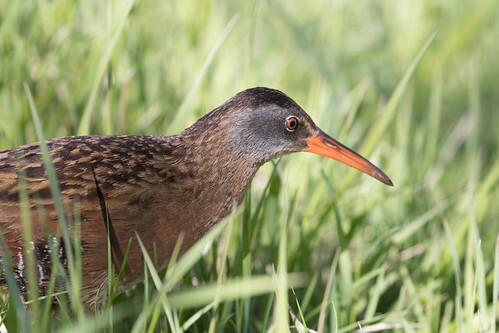 One of my favorite groups of birds includes species I’ve heard far more often than I’ve seen: the rails. 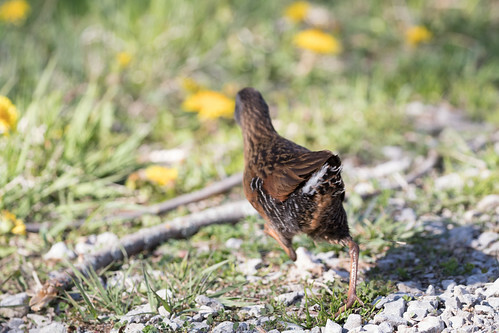 I’m particularly fond of Soras and Virginia Rails. Hearing them is always fun, but somehow because seeing them is so much harder, it’s a Red Letter Day when I do get a glimpse, and cause for celebration if I manage to get even a poor photo. 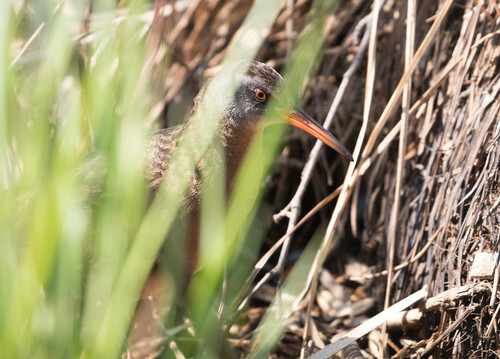 When I started birding, before experienced birders clued me in on the most efficient ways to see birds, I spent a lot of time at the edge of marshes scrutinizing every space between cattails trying to see rails and bitterns. Sure enough, I saw them much more frequently than I do now. 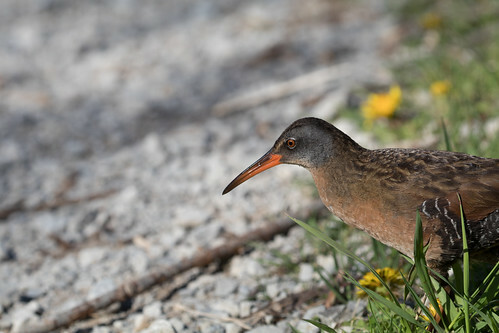 When the American Ornithologists’ Union met in Madison, Wisconsin, in August 1978, I managed to give the participants on my field trips to the Picnic Point area great looks at a Virginia Rail and her chicks. 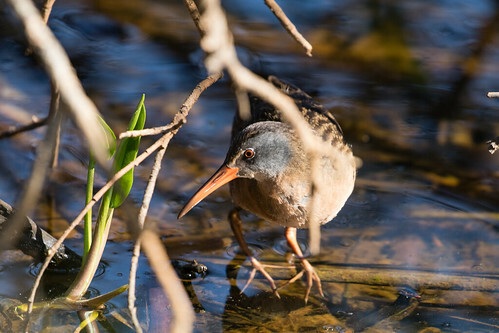 They seemed to think that I had some super skills, but it was simply a matter of getting to know one particular small marsh really well, and scrutinizing the spaces between cattails until I spotted something I knew was supposed to be there. With experience, we start taking shortcuts. 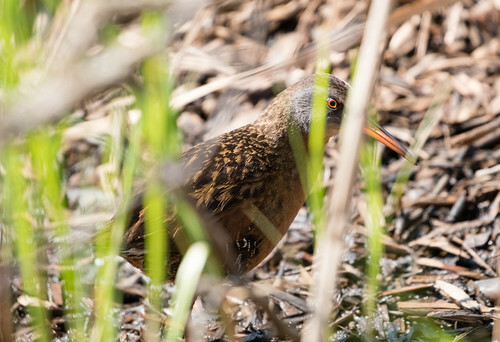 We maximize our birding time, at least in the sense of finding the biggest numbers of species, when we don’t spend time searching for skulkers but in exchange for a slightly larger list of birds seen in a day we lose pretty much our entire chance of spotting rails. Even though I don’t search for rails as often as I used to, every now and then I do park myself at the edge of a marsh for a while to look for them. 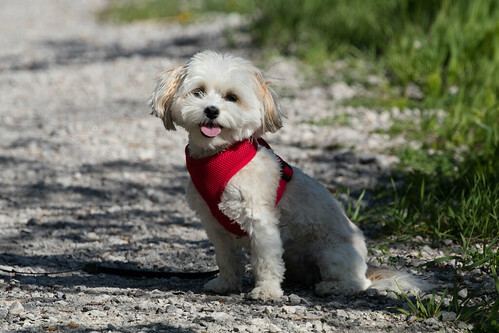 On May 8, I took a walk with my dog Pip at the Western Waterfront Trail, and when we were walking past a wonderful marsh area, a couple of Soras started calling from not too far away. So I went to the very edge of the mucky marsh and knelt down, and Pip sat down at my side. 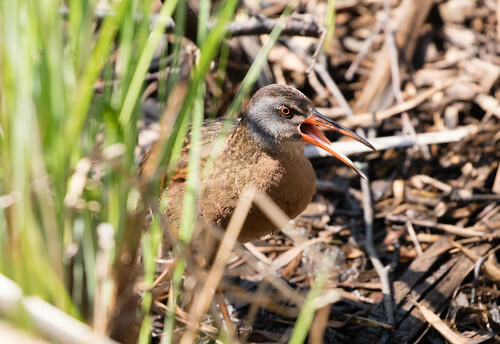 We saw one Sora fly over, and I made a couple of pitiful imitations, and suddenly what should walk into view but a Virginia Rail. Pip and I were enthralled—she watched the bird’s every move, both within the marsh and when it came out and walked past us—but she stayed completely rooted at my side without my saying a word. 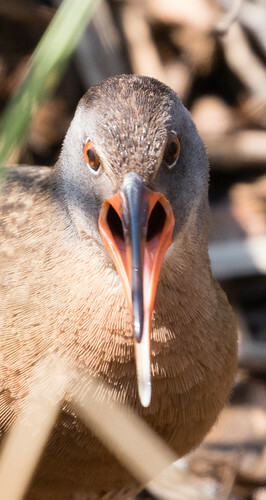 At one point, the bird I'm assuming was the male started making a cool grunt call. During it, he turned his head directly toward me for a moment, but that seemed random because he was looking every which way. 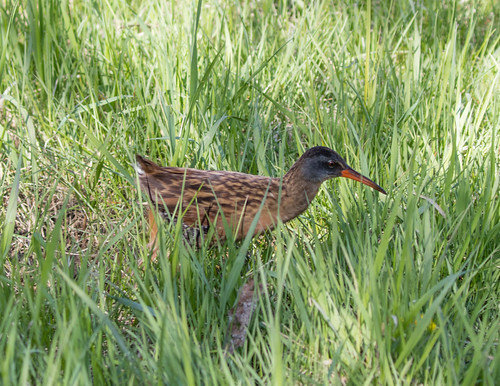 During that lovely interlude, I spotted two Virginia Rails and three Soras, though I didn’t get photos of the Soras. I was ever so pleased that the birds didn’t seem to be paying attention to me or Pip, who is simply the best birding dog I’ve ever known. Pip and I went back there a week later, on the 15th, and heard rails again but didn’t spot any. 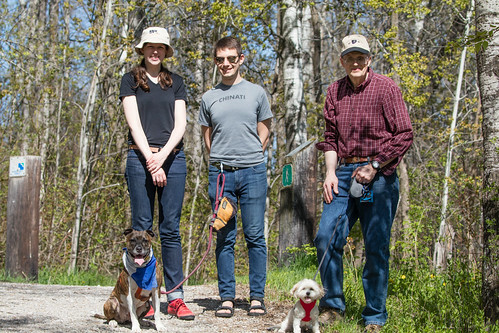 Then on the 18th, we took a hike there with Russ, our daughter, our son-in-law, and their dog Muxy, who is a large pit bull. 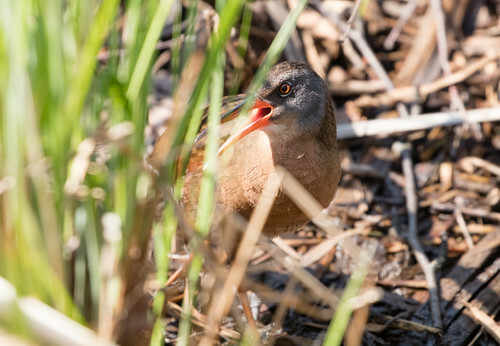 Pip and I were a little ahead of the others, and when we were walking past the rail section, right where the trail divides off a tiny section of marsh, one of the Virginia Rails ran out from that smaller part of the marsh right across the trail into the larger marsh. Katie and Michael kept Muxy at a distance while I got more photos of the rails, who are apparently nesting in there somewhere. I’m going to be in Maine until June 15 now, so won’t be able to check on them during incubation. I don’t get off trails to search for nests anyway, but with luck when I come back there will see some adorable little black balls of fluff running about to fill my heart with joy.